Imagination. OK this is a good one. I have these topics written down in a little notepad, and I have "Imagination" written down. What follows is me trying to remember what the hell I meant by that and trying to write an article based on one word. Think back to the eighties. Admittedly I wasn't there for long, but if you're like me you were raised on stuff MADE then. Remember how many awesome things came out? Back to the Future, The Terminator, Labrynth, Beetlejuice, Ghostbusters, The Goonies, Gremlins, and I could go on. All of these films are completely recognizable, work not only as entertainment but as film, and have interesting characters. They can be enjoyed by kids and adults, laymen and film critics, browncoats and trekkers. And they were dreamed up by some truly talented people. 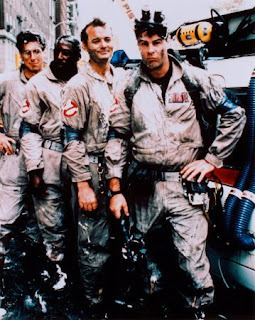 Nobody (famous)today could think up the things Dan Aykroyd and Robet Zemeckis thought of. A team of paranormal investigators who function like exterminators? Hell yes. Sign me up. What I want to know is: Why aren't movies that good made today? If you're looking for good or (to use an overused word) original ideas, not much is offered in movies today. Maybe that's not being fair. Let me at least say this: older movies are usually better. Not only that, but the concepts for the movies were made up on the spot back then (by which I mean not copied). Yes, I know what there's only something like 9 stories in the history of mankind, but if that meant anything we would have stopped having stories to tell sometime around a bajillion BC. I think we stopped trying to do new and exciting things with those stories fairly recently. Then we just kind of looked to the past few decades and ripped them off. Transformers, one of the most popular movies to come out in recent history, is based on an 80s property. Terminator salvation? Ditto. The Bourne Identity (one of my favorites)? The Ludlum book was written in the 80s. Most of the non-sequel, acclaimed movies of today, while I'm sure are very well-made, well-acted pieces of film, are largely lacking in the "awesome" category. I looked around at the most popular movies of 2009, which include movies like Night at the Museum 2, Avatar, Harry Potter 6 (6! ),and 2012. On the other end of the spectrum on the highest-rated movies, we have The Wrestler, Wild Heart, The Hurt Locker, Capote, and so on. Examine these titles and, if familiar with them, reflect for a second on whether these are movies you want to see. If you're like me, these movies don't really inspire that "gotta see it" feeling. While they may be well-made, conceptually they're just so boring Let met just say: I'm sure the Wrestler and movies like it are spectacular. They are highly-rated among critics and I usually agree with critics over the general moviegoing audience. However, I'm just not inspired to go see them. What I'm saying is that movies today lack a kind of ridiculous awesomeness, a sort of sense of humor that has been lost lately. I understand that methods and taste change over time, but this is a trend not worth losing. It's like movie producers today are more afraid to do something novel, crazy, and out there. If you know who Noah Antwiler is, you know that he's drawn a distinction between something "awesome" and something "good". . A movie can be one or the other, or some of both, but they are separate elements. Today's movies lack awesome. There aren't any crazy ideas out there anymore.